A week of cycling round the Yprés salient exploring the extraordinary sites of the barely shifting Front Lines of this small sector of the 1914-1918 conflict churns up deep emotions, frequently accompanied by quiet sobbing. There is so much to see that emphasises time and again the utter waste and downright madness of this needless war, not least the thousands of headstones bearing the simple legend ‘A Soldier of the Great War’. 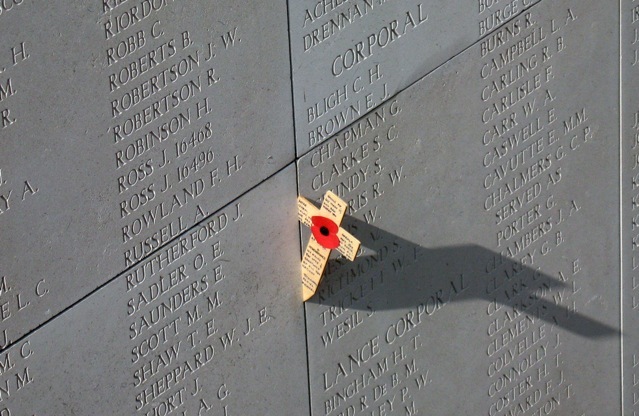 For British and Commonwealth remembrance, there is the Menin Gate, where the names of 54,900 men who simply disappeared into the mud are inscribed, and the overflow at Tyne Cot Cemetery, where a further 34,888 are inscribed. 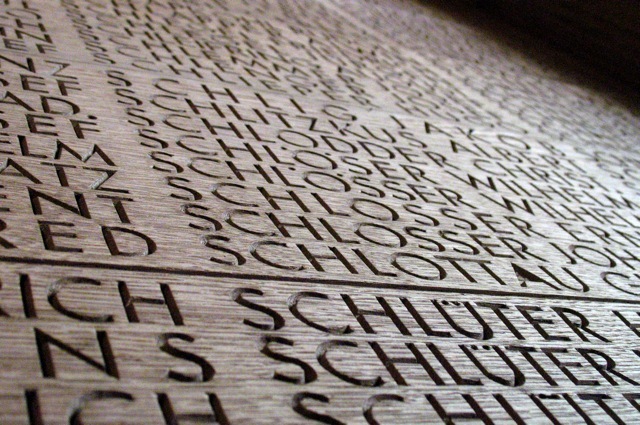 At the Menin Gate, names of those lost forever in the mud of Flanders. But the question posed by so many I spoke to, from all nationalities, was where are the tens of thousands of German boys remembered? Where is their Menin Gate? Even the Germans didn’t know, but then they seemed even more ill-informed about WW1 than us Brits. The rather dour German cemetery at Langemarck names 44,292 soldiers and airmen, and is the largest in Belgium, but that is barely a tenth of those who fell in the salient. Most disquieting are the tens of thousands of names of student volunteers carved into the oak panels of the entrance chambers. The most surprising was my discovery of the memorial to Lt Werner Voss, the flying ace ‘hero’ of Sean Fahey’s TEAW story, The Hunter. Memorial to Werner Voss, subject of Sean Fahey’s The Hunter story. 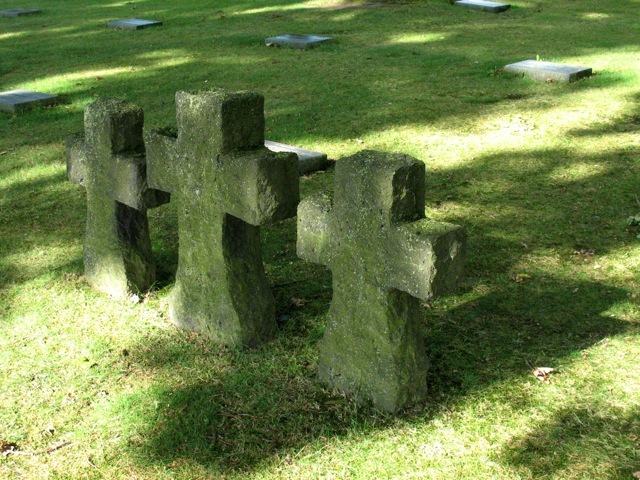 But it was heartening to visit so many British and Commonwealth cemeteries that contained headstones to ‘Ein Unbekannte Deutsche Soldaten’ or ‘Krieger’. In a few cases, names were known and distant relatives had placed poppy crosses at their foot. In Aussie graveyard, five Stars of David and a small oak (in Germany, a symbol of strength) sat at the foot of Lt. Max Seller’s headstone. At Langemarck Cemetery, names of German student volunteers. With two world wars in a single century to answer for, it is impossible to imagine the conflicted emotions Germans must have about their war dead. And yet these were just boys, barely men, and somebody’s son, father or husband, now somebody’s great grandfather or great uncle. How and where do they grieve, and if they can’t, what has that done for the national psyche? Are they even aware that we do not hold ordinary Germans responsible for Kaiser Wilhelm and Adolf Hitler!? 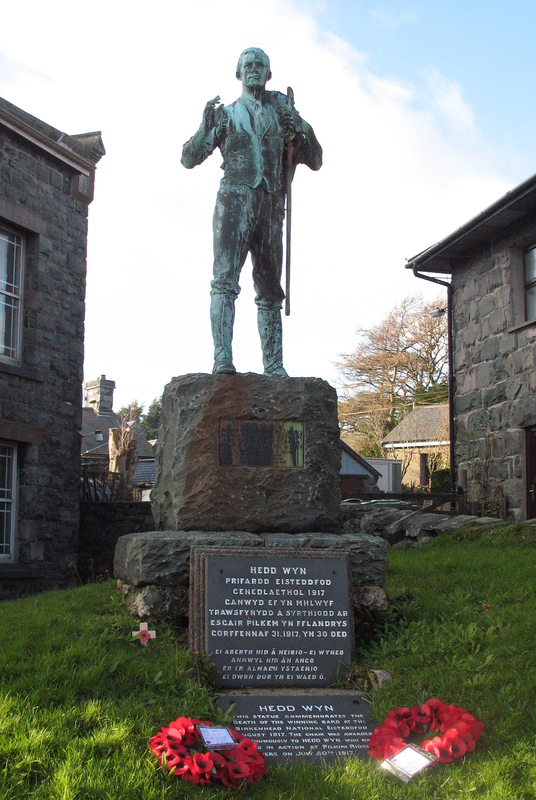 I was excited about including in TEAW the story of a war poet who wasn’t a War Poet, who was from hill-farming stock, rather than Oxbridge, and who had taught himself to compose verse to the intricate prescripts demanded by local poetry competitions (eisteddfodau), of which he won four. That Jonathan Clode is a Welshman writing about fellow Welshman Ellis Humphrey Evans, who won the National Eisteddfod in the year he was killed at Passschendaele, invested the story with added piquancy. I was further delighted that JC’s research involved contacting an Arch Druid, an acknowledgement no other WW1 comic is ever likely to boast! As with all the stories JC and myself took editorial responsibility for, I had to do a certain amount of reading to make critical sense of how he was handling Ellis’ story. I discovered the family’s farm, Yr Ysgwrn, and the five bard’s chairs he won still existed, and could be visited by special arrangement. Hooking up with Conwy Library Manager, Cheryl Hesketh, for whom I had recently presented a couple of talks, I booked a visit through the Snowdonia National Park, feeling a little embarrassed that just two of us were bowling up. 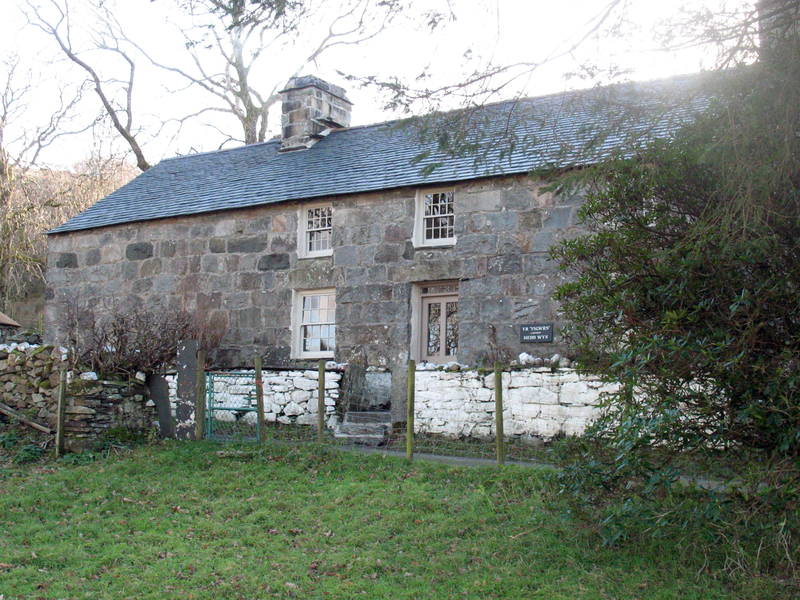 Before our appointment, we made time to explore the small village of Trawsfynydd, on the south eastern shore of Llyn Trawsfynydd, and stumbled on Pen Lan, the terrace house where Ellis was born in 1887. A remaining wooden strip that might have held an estate agent’s sign suggested it had recently been sold, possibly to the National Park, who have plans to develop the story of Ellis in the community. On a small patch of grass beside one of three chapels in the village stood the memorial stone to the bard, surmounted by a truly affecting bronze statue of Ellis as shepherd, in gaiters and waistcoat, and carrying a crook. He stares wistfully in the direction of the hill-farm, one arm raised to catch the muse. A mile to the southeast, on the north-facing slope of Ffrîdd Ddû, the farmhouse is a substantial two-storey block typical to the area, but in this case, by virtue of it’s heritage, a Grade II listed building. An adjacent barn has been gutted in preparation for the Park’s plans for an interpretive centre, and the fields about are still grazed by sheep but no longer managed by the family. 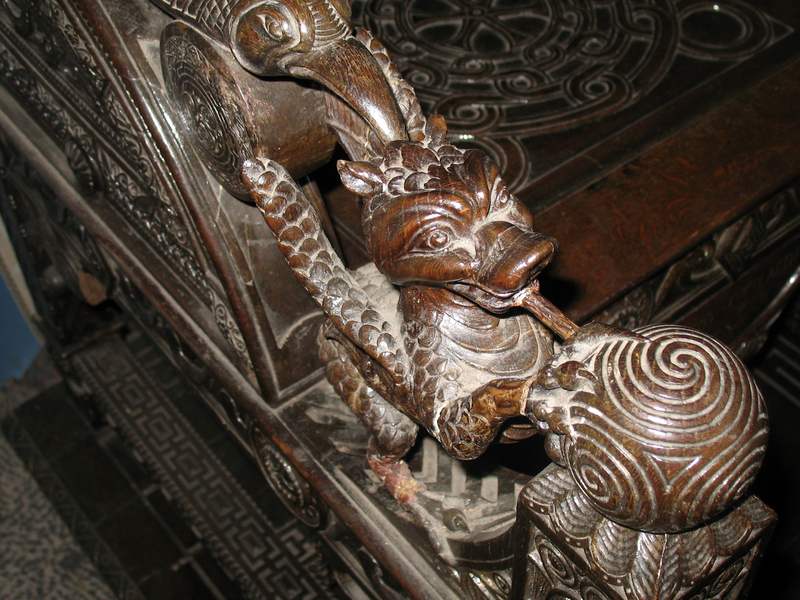 Ducking through the front door, the damp hit me as forcefully as the obvious fact that every fixture and fitting was badly in need of restoration. To the left, we stepped into the meager warmth of the kitchen scullery, where Gerald Williams, Ellis’ aging nephew, was brewing up on the range. To the right of the fireplace, impressive shelves of Ellis’ books were quietly rotting. On the back wall stood a beautiful sideboard displaying the family’s prized collection of Willow Pattern. A clock on the wall had had historic layers of wallpaper applied round it. Gerald is an old hand at keeping Ellis’ flame alive, and delivers a well-rehearsed patter laced with nationalistic rhetoric and amusing irony. 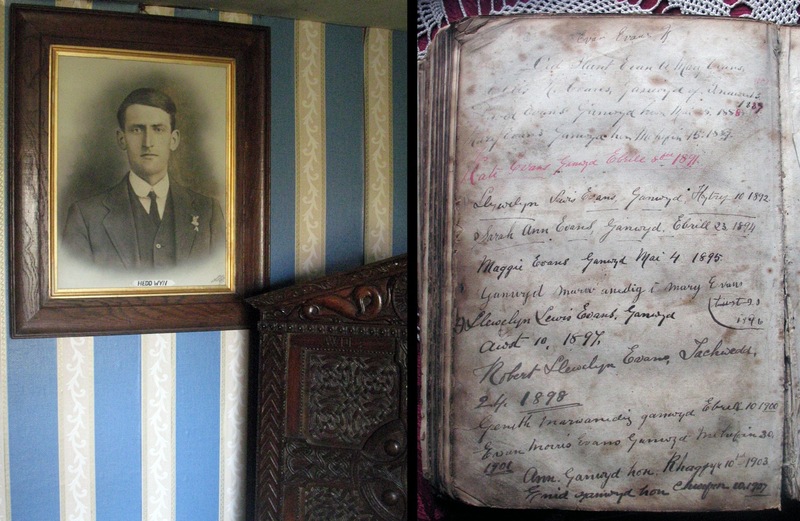 He showed us the letter and large tin medal the family received for Ellis’ ‘supreme sacrifice’ in the Belgium mud. The parchment was a flimsy sheet of office paper and only printed with parchment texture. He showed us the family Bible, with Ellis’ name written at the top of the frontispiece. I handled it with trepidation, fearful it would decompose in my hands. Cheryl Hesketh from the libraries was horrified. As we stepped out for the obligatory photo, the clouds rolled over the hills beyond Afon Prysor and sank into the reservoir. Gwynedd glowed, Gerald chuckled at some dig I directed at the English rugby team, and Cheryl muttered “Nid â’n angof” (“It will not be forgotten”). My fear is that Ellis’ heritage is so firmly in Gerald’s grasp, the National Park is facing a tussle to wrestle it out of his hands in time to restore and preserve what is left that’s for real. 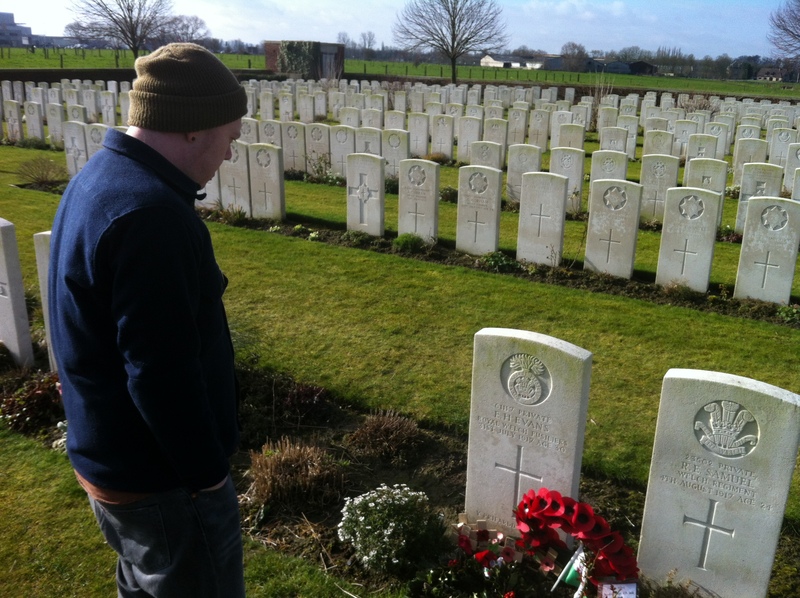 Having spent over a year writing and editing TEAW, one half of the editorial team – that being me – just took a trip to Ypres (or Ieper) to see the real scars the First World War left behind. The TV documentaries are coming thick and fast, but to get a true sense of the scale of loss, and the impact it had on Flanders, you really need to see it with your own eyes. Without any sense of exaggeration, I can honestly describe my three days exploring the battlefields and cemeteries of the Ypres Salient as the most harrowing experience of my life. Ypres market square as it stands today. The landscape is an eerie constant of silent fields punctuated every few metres by cemeteries, mainly British, Commonwealth and of course, Belgian. They dot the landscape with such frequency it made me wonder how the locals could live amid such grim reminders, and that was before I’d even visited anything. I would later come to discover that toiling the land often reveals greater horrors, as the ground gives back the many men who fell upon it and were never found. The Menin Gate is a stark example of this. All along it’s enormous walls and arches are carved the names of 55,000 British and Commonwealth combatants whose bodies were never recovered. It is estimated only 20% of casualties in WWI were caused by bullet wounds. The vast majority of the other 80% came from artillery bursts. The phrase ‘blown to bits’ was coined during the fighting. Every night at 8pm local firemen conduct the Last Post ceremony. Almost 800 people turned up on a cold Friday in late Febuary, and despite the odd halfwit holding up his ipad so he could capture an experience instead of actually having one, everyone present seemed to genuinely pause and reflect upon what it was all for. The following day I went on a personal pilgrimage to the grave of Welsh poet Hedd Wyn, personal because his was one of the stories I wrote for TEAW and I’ll discuss that in more detail in a future blog, but seeing the resting place of a man whose life I’ve been living inside since March last year was as close to the loss of my own family I think I could get. The grave of Hedd Wyn at Artillery Wood Cemetery. 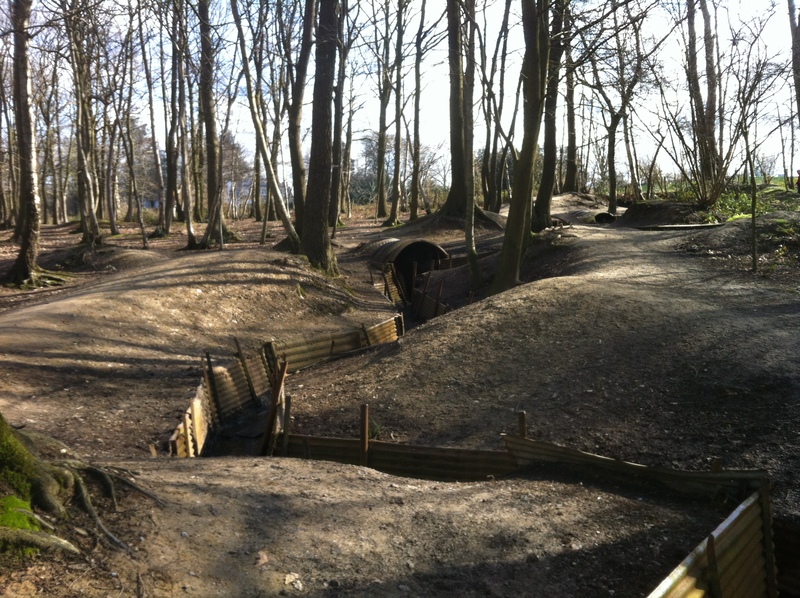 At Hill 62/Sanctuary Wood we visited one of the few surviving trenches. Fittingly it had been victim to the elements and was full of rain and mud. 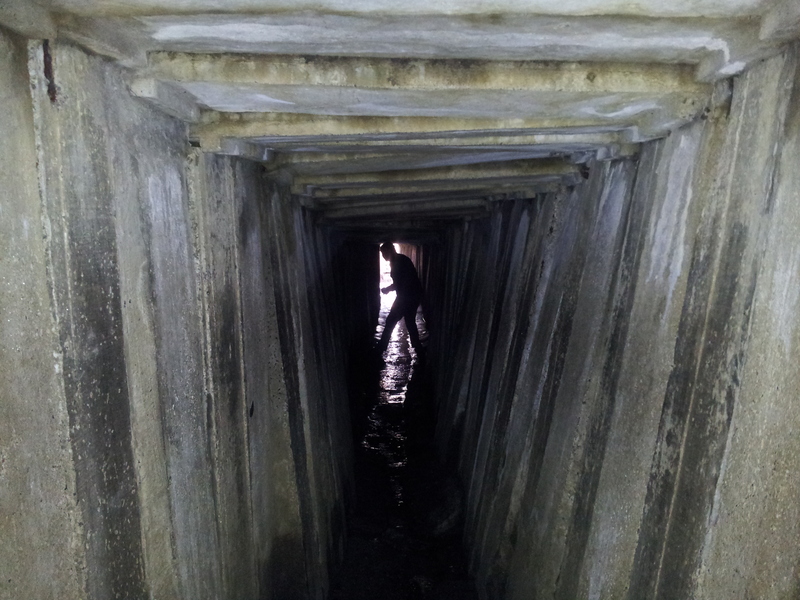 There was also a narrow, pitch black tunnel that ran beneath the trench. To say that I came close to the sensation of trench life on a sunny Saturday afternoon surrounded only by some dozing sheep and a German touring party would be foolish, but as I fumbled my way through the darkness, the sense of dread was palpable. The Hill 62 museum was a place more akin to a WWI themed junk shop. Amid the astonishing collection of pickelhaube’s (spiked German helmets), Big Bertha fragments and excavated horse bones sat a series of stereoscopes inside which lived a collection of images that will haunt me for the rest of my days. No doubt hidden from the public to conserve morale, I can only say that if there is a limit to the devastation the human body can suffer, these photographs would argue otherwise. 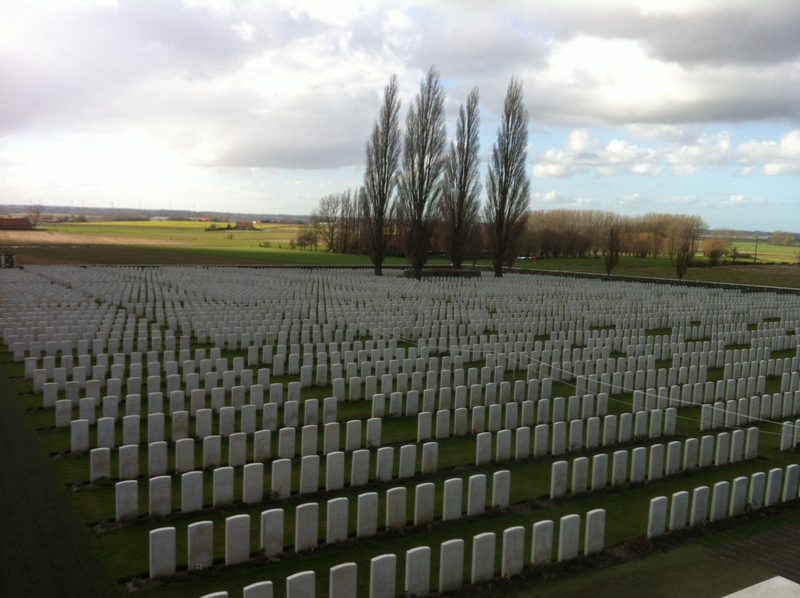 Tyne Cot Cemetery is the largest British and Commonwealth cemetery in the world. There are 12,000 graves with another 8 and a half thousand names upon the walls to mark those whose bodies could not be found. As you enter, a young woman’s voice reads out the names and ages of the dead. I stood in that initial area for about ten minutes and listened to the roll call of waste. One or two were in their early thirties, but almost all the names I heard were 22 or younger. Ypres itself is home to a beautiful market square. 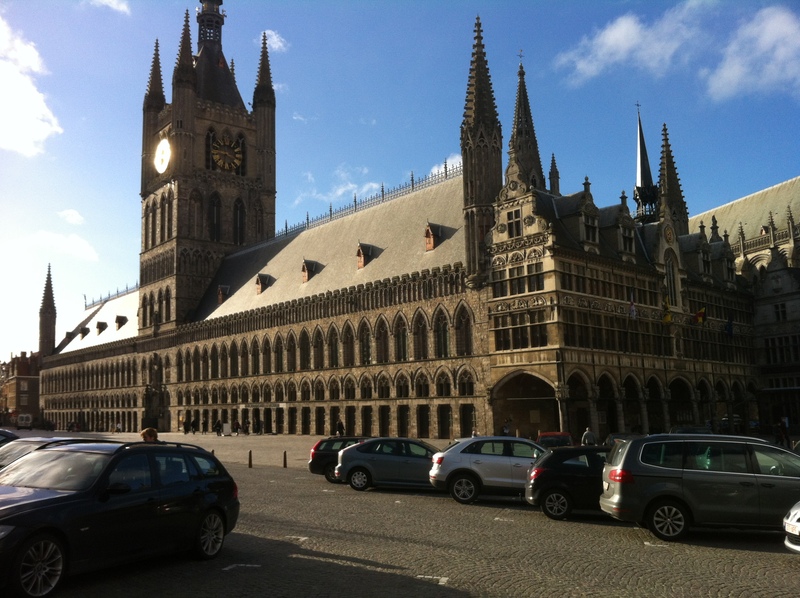 At its centre sits the Cloth Hall that houses In Flanders Field Museum. This beautiful building looks distinctly medieval, but was in fact reduced to rubble during the 3rd Battle of Ypres. Afterwards, following much deliberation about whether to build a new town or consign the remnants to history and move on, its survivors were resolute that their town should be rebuilt as it was. You can see the marks from artillery fragments in the few original bricks that adorn the front of the building. 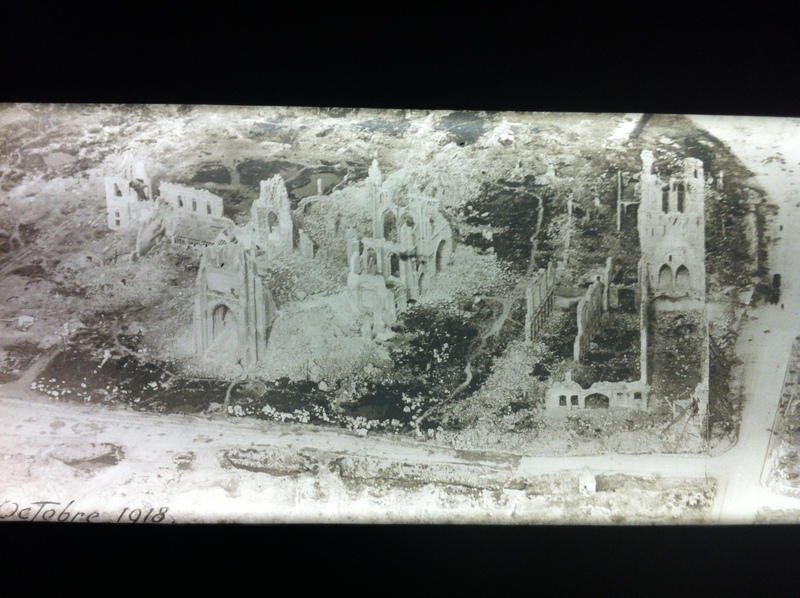 The museum itself is a terrifying trek through the history of WWI as seen through the events that befell Ypres. A continuous sense of foreboding took residence in my stomach as I walked past German gas masks, British clubs and knives used for nighttime raids, pictures of mutilated soldiers turned to the wall and placed high enough that children cannot reach them, and stretchers that still hold the sweat and blood stains of the men who once laid upon them. When you reach the end of the exhibition a series of banners list every war we have inflicted upon ourselves since 1918. There were easily over sixty. Perhaps most unnerving were the groups of soldiers, barely out of their teens, who wandered around, wide eyed and disinterested, like children forced to go shopping with their parents. If anyone should take account of the reality of War, it should be the people who will one day be forced to wage it. Remnants of the Cloth Hall from the summer of 1917. 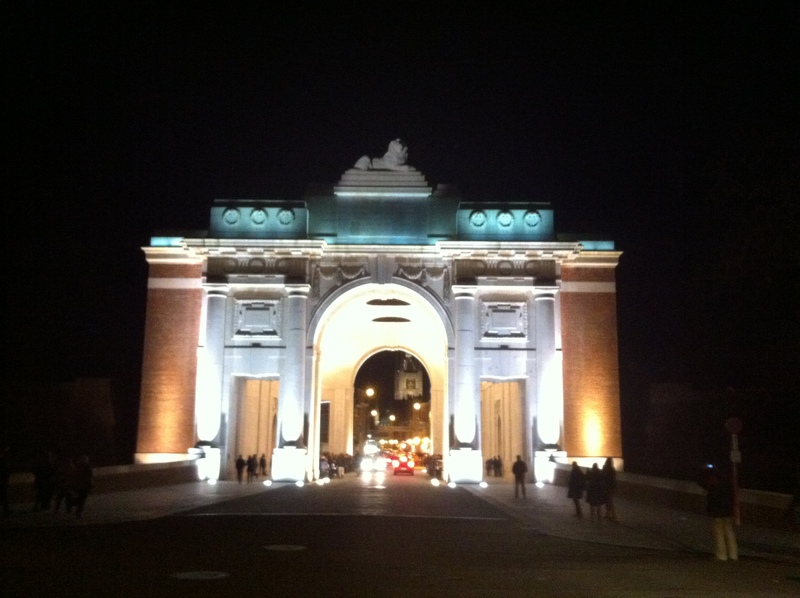 Siegfried Sassoon, poet and survivor of WWI, called the Menin Gate a ‘sepulchre of crime’, a view I tend to share. But that does not mean that I do not honour the men and women whose lives and bodies were broken by the interests of Princes and Imperialists. All across the Ypres Salient, it struck me that there were two distinct types of remembrance – the stoic, nationalistic pride in a necessary sacrifice (see D. Cameron & Co.) versus the grief that comes from the futility of it all. If the people who visit Ypres see the same things I did, then I fail to understand how they can take pride in the decisions of any nation that chooses to condemn its son’s to such a fate. I said that I wondered how the people of Ypres lived amid such horror. They do so because they have no choice. They can’t and won’t deny their contempt for the decisions that led so much blood to be spilled across their fields almost a hundred years ago. As a Welshman and a member of this disunited Kingdom, I have to then wonder, why must we? great read that. over 30 years ago i had the pleasure of talking to a chap in a nursing home who was at hill 62. Sad that there’s no voices left to tell us the truth. Cheers Rob! Most kind Stu, most kind. Hi there, and thanks for the kind words. To be honest I knocked this up using a wordpress free template that suited our needs & the style of our book. You are limited by what you can do but it’s fairly easy & accessible. To answer your question: we Germans normally mourn our loved ones in privacy. It is not politically correct to honour them in public. This might be due to the outcome of the Second World War, which brought into being the Anglo-Saxon vassal state which is the FRG.